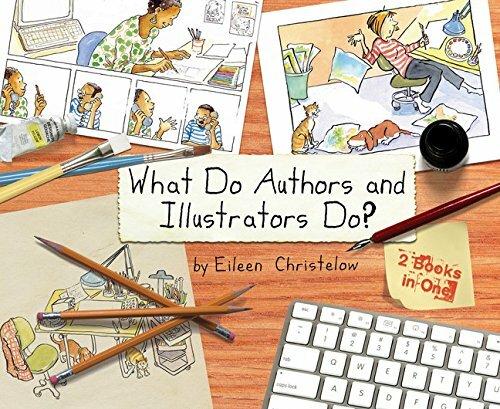 A true teacher always finds a creative way to get her message across and author/illustrator Eileen Christelow’s latest picture book What Do Authors and Illustrators Do? is a perfect example. This adorably illustrated book—actually two books in one—chronicles the meticulous process of taking a picture book from idea to finished product. Ms. Christelow begins with the premise of two friendly, creative neighbors, one with a dog and one with a cat. When the two pets get into a chasing match, the neighbors each get an idea for a picture book. One writes about a cat-chasing dog, and the other writes about a dog-chasing cat. From there, Ms. Christelow builds a fiction storyline that explains the nonfiction process of researching, writing, editing, completing, and submitting a picture book. Her visual and verbal explanation shows where writers get their ideas and how the same idea can lead to markedly different books. She also gives a live demonstration of what “revisions” are by marking through some of the sentences in the dialogue bubbles, then rewriting them on the next line. There are lively, kid-friendly sketches of each author at the library with armloads of books for gathering facts, and other sketches where the authors interview the postman for his opinion on dogs, or an elderly neighbor who remembers heartwarming cat stories. But the illustrations don’t stop there: There are scenes of each author sitting with family members who tell what they do or don’t like about the story; the authors weeping at the mailbox when their stories are rejected; the authors congratulating each other when their books are finally accepted; and the authors groaning with dismay as they begin their rewrites. While all this is going on, Ms. Christelow also manages to teach readers what it means to draw “to scale” and what sketches look like when different media are used. She also offers readers a dual dialog on each page: The narrator’s dialogue, which explains the creative writing process from moment to moment, and the “thought bubble” dialogue, which expresses each author’s thoughts, fears, frustrations and joys as they develop their manuscripts from start to finish. What Do Authors and Illustrators Do? is a versatile book. It is part entertaining picture book, part mini-encyclopedia for adult writers, and in both cases can be used in discussions about thought processes, creativity, family support, and perseverance. Also, despite the elementary illustrations, it might find solid footing as supplemental reading in the area of teen vocation books, and it should also receive a warm welcome as a reference book for newbie writers who have no clue what the writing life is really about.